Photo by Evan Sung. Used with permission. As part of our spotlight on African heritage food during Black History Month, we had the pleasure of catching up with chef Pierre Thiam. His most recent cookbook, Senegal: Modern Senegalese Recipes from the Source to the Bowl, was a ﬁnalist for the James Beard award for Best International Cookbook. 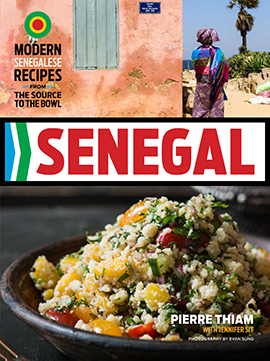 Oldways: In your cookbook Senegal: Modern Senegalese Recipes from the Source to the Bowl, you beautifully illustrate the diversity of Senegalese cuisine by highlighting the agricultural and ecological diﬀerences in the various regions of the country. What are a few things that may surprise people about your native cuisine or that you like to highlight for those who are encountering it for the ﬁrst time? Chef Pierre Thiam: People may be surprised by Senegalese cuisine’s diversity and its nutritional wealth. Many of the ingredients found in Senegal are considered superfoods or nutritionally superior (moringa, fonio, millet, baobab, and palm oil, to name a few). Another surprise would be the fact that Senegalese cuisine may seem so familiar. Indeed, our cuisine has inﬂuenced much of what is known today as Southern cuisine, although many of those ingredients arrived to these shores through the Middle Passage. OW: In Oldways’ A Taste of African Heritage six-week cooking and nutrition series, we try to emphasize for participants the commonalities between dishes, culinary techniques, and ingredients that span the African diaspora. Can you describe some of the most striking parallels that you’ve seen between Senegalese cuisine and cuisines of the American South, the Caribbean, or Latin America? PT: Because of the Middle Passage, many ingredients and recipes that are found today in those regions of the world have origins in West Africa. Gumbo from Louisiana is just a version of our Soupou Kanja, jambalaya is jollof rice found in our national dish thiebou djenn. Hoppin’ Johns is a Senegalese rice peas dish known as Thiebou niébé. In the south, Brasil Acarajé is a version of our black eye peas fritters called Accara. Many ingredients and recipes [from the American South, the Caribbean, or Latin America]…have origins in West Africa. OW: You are on a mission to educate people about African superfoods, especially fonio. For those who aren’t acquainted with fonio, can you describe this gluten-free ancient grain that has been called a “miracle grain?” What is it about fonio, both culturally and nutritionally, that makes this is a food worth championing? PT: Fonio has been cultivated for more than 5,000 years and is probably the oldest cultivated grain in Africa. It is gluten-free and particularly rich in cystine and methionine, two amino acids that are very important in human growth and not present in most major grains.In addition, fonio is great for the environment. It grows in poor soil, is drought resistant, and is one of the fastest maturing cereals. Another reason to champion fonio is that it grows in one of the poorest regions of the world and its success would bring prosperity to those regions. OW: In a TED talk, you discuss how fonio cultivation may also beneﬁt the people of the Sahel region. Can you describe your vision? PT: Yolele Foods (www.yolelefoods.com ) has teamed with NGOs like SOS Sahel to organize, equip, and train family farms in the Sahel region in order to eﬃciently produce fonio. We’ve also partnered with local investors and are setting up the world’s ﬁrst fonio mill that adheres to international standards. The mill will buy the fonio production from the farmers in our network of communities and process it for markets in Africa and the rest of the world. OW: Can you let people know how to best access fonio in the U.S. and give them a few suggestions about how to prepare it? PT: Yolele is now selling fonio at Amazon and Thrive Market. We are also at Whole Foods Harlem and plan to expand to other Whole Foods stores in the region. There is a Bambara saying that goes: “Fonio never embarrasses the cook.” Indeed, fonio is quite easy to prepare and can replace any grain in your favorite recipes. It cooks in ﬁve minutes on the stove top and can also be prepared in the microwave. Just like rice, 1 cup of fonio cooks in 2 cups of boiling water (cook covered at a simmer until all the water is absorbed in approximately 5 minutes, then ﬂuﬀ with a fork.) Our website www.yolelefoods.com  oﬀers many fonio recipes. OW: In America, we celebrate a lot of diﬀerent cuisines from the around the world. Some might say that the public here has been slow to catch on to the beauty and complexity of what the large continent of Africa has to oﬀer. Are you seeing an increased interest in African heritage foods and ﬂavors since you ﬁrst opened your restaurant in New York? And if so, what are some examples of this increased interest? PT: The interest for African food is growing as consumers are becoming more conscious of their diet. Our traditional diet is well balanced with beans, leafy greens, grains, and legumes. Many African ingredients ﬁt in the category of superfoods. Exotic ingredients like moringa, baobab, and fonio are now entering the market and American consumers are responding positively. OW: How has living in America (or New York in particular) shaped your approach to Senegalese cuisine and cooking in general? Are there diﬀerent combinations of ingredients that you now bring to your dishes or avenues of experimentation that you have pursued because of your relocation? PT: Even though my cooking is inspired by the food of West Africa, I’ve lived and worked in NY for most of my career life. So I’m not presenting traditional cuisine the way it would be presented at home. Back home we eat around the bowl traditionally, but here I present my food with the aesthetic of the plate in mind. We eat with our eyes ﬁrst, so it’s important that the plate looks beautiful. Photo by Folasade Adeoso. Used with permission. My approach is more contemporary; my food is lighter, less heavy. I try to use less oil. I introduce ingredients that you wouldn’t necessarily see in traditional West African cuisine, but that blend perfectly well with the food of Africa. The way I use fonio is a good example of this; usually it is eaten as a base grain for heavy sauces and porridge, but here I make a fonio beet salad with fennel and pickled carrots, like something you would ﬁnd in a fancy restaurant or a Whole Foods. 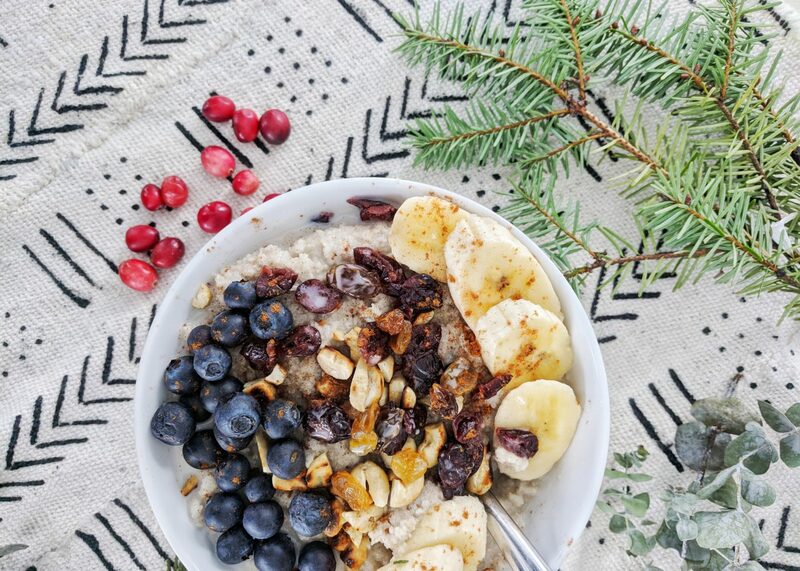 You can also check out our recipe for creamy fonio hot cereal with dried fruit ! OW: These days, people have less and less time to cook. What are some lessons that you can give home cooks about preparing easy, healthy, and particularly plant-based meals on the weekdays with ﬂavors and ingredients of the African diaspora? PT: What I recommend to people is to have their mise en place ready. You can save so much time by preparing the ingredients ahead of time and just assemble them when you’re ready to eat. When I prepare, for example, ndambe, which is a stew with black-eyed peas, sweet potato, tomato, and okra, instead of following the recipe and cooking everything in one pot, I cook the black-eyed peas the day before (since they take longer) and I blanch my sweet potatoes in boiling water separately. All that can be done ahead of time. I clean and cut my okra separately and then when I’m ready to eat I will assemble it all in a tomato sauce. We’re so grateful for Chef Thiam’s time, and highly recommend his wonderful book! 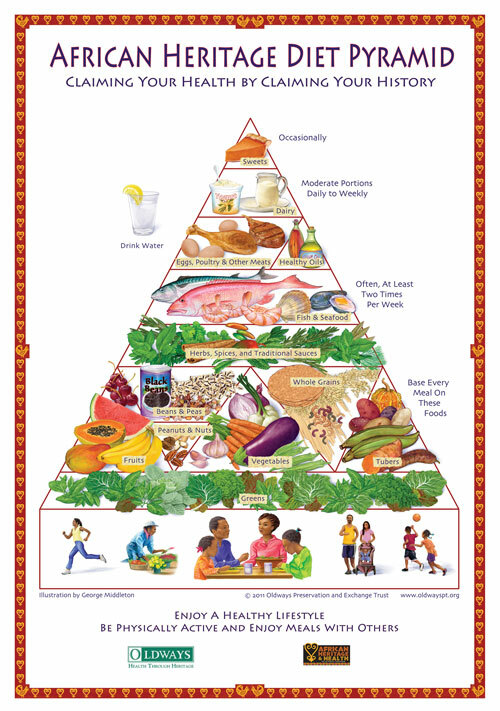 And while you wait for it to arrive on your doorstep, we also recommend that you check out the Oldways African Heritage Diet Food Pyramid (right), which depicts the core foods of the African diaspora. You can also check out the African heritage cuisine recipes on our site . To learn more about African heritage cuisine, and to attend a cooking class near you, check out our page about A Taste of African Heritage .